I. Videogames are always screaming about politics. Every Call of Duty game comes screeching out of the caves of Activision with a weird mix of heroic individualist libertarianism and a love of the military-industrial complex unparalleled in media. The Metal Gear Solid series is basically military fan fiction, pointing backward and forward in time to construct what could have been and what is to come with equal measure. Even our fantasies, be they of Witcher or Warcraft varieties, are deeply embedded in a framework of watching political machinery function. If we take a long enough view of most game franchises, it all starts to look like different valences of The West Wing. Just like that beloved television show, these games all wear their political biases on their sleeves. Those are just the narratives that are ostensibly about particular political struggles. If we look at games that model politics as a system, we have an entire genre that uses political machinery as its backbone: Civilization, SimCity, This War of Mine, and Crusader Kings all take on varying degrees of abstraction in order to make claims about how politics work. Just like the games showing close-up narratives of political struggle that I mentioned above, these games have particular assumptions that inform them, although they often appear in a more interesting way. A story about a federation of various Latin American countries collectivizing and invading the United States in Call of Duty: Ghosts carries some assumptions; Gandhi attacking with brutalizing offensive capabilities in Civilization II does as well. These two modes of focusing on governmental politics in games, narratively and structurally, rarely have much to say about political parties. Metal Gear Solid V does not have Snake negotiating between three different Afghani groups in order to come to a solution to a problem. Rather, there is an “us” and a “them” and the narrative parses out who we are supposed to identify with in the game’s postcolonial critique. The same goes for a game of Alpha Centauri. You might have to negotiate between different factions that all possess different viewpoints, but there is no parsing through those points to find compromise or friction. They get behind the player’s decisions or they are eliminated in some way. When the Transportation advisor in SimCity 2000 tells you that you’ll rue the day you cut his budget, you can’t retreat behind a strong wall of party politics to explain that the glorious revolution requires a consolidation of the Transportation Department into the Agricultural Department. II. 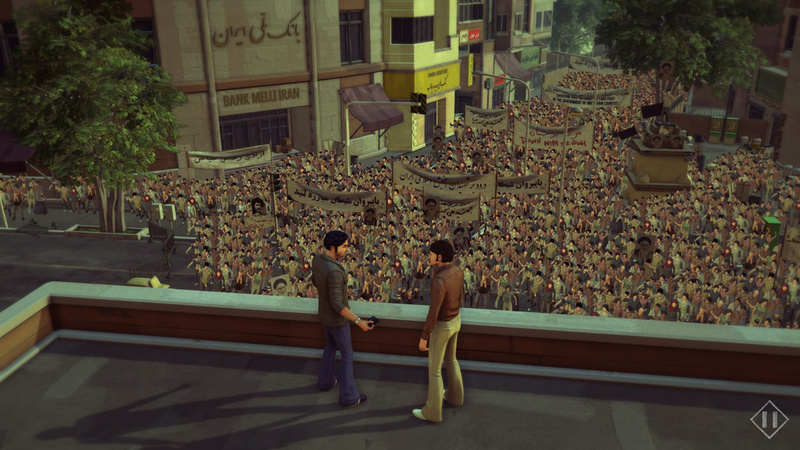 1979 Revolution: Black Friday is a game about the Iranian Revolution created within an adventure game framework by iNK Studios. To put it plainly, the game looks and plays like a Telltale game. Unlike Telltale’s games, which tend to place players within established film, television and comic book universes where they can experience pulpy or thriller-esque storylines, Black Friday places you into some events that actually happened. 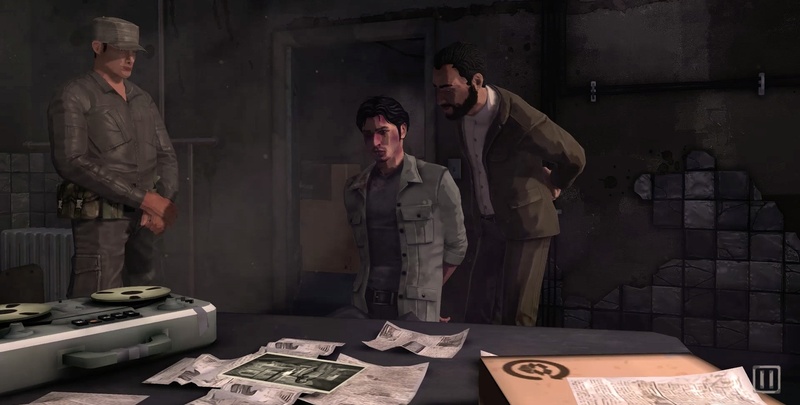 Telltale’s The Walking Dead series of games tell stories about people in bad situations. The attraction of those games is the Choose Your Own Adventure framework created by their combination of dialogue, movement and action events. By using your reflexes, or your attention to detail, or your desire to provoke or help people through what you say, you negotiate situations to various kinds of resolutions. It’s fun to experiment, but it’s also fun to commit to a particular kind of playstyle to see what happens. Telltale’s designers and developers know this, and the percentages of choices at the end of each chapter that tell you how you line up with other players is meant to give you some context for your actions. Ultimately, though, the lack of grounding makes the whole thing fun (and moments like the first episode of Season 2 where things get “too real” are violently alienating). The Iranian Revolution is profoundly complicated. Its reasons for happening are grounded in local history, international postwar meddling, power grabs by countries like the United States, religious conflict, ideological conflict, and basically any other possible point of friction. I don’t feel remotely qualified to write about it beyond that former sentence. Recognizing some of those tensions, Black Friday holds to a simple tenet: you can tell a story about the Iranian Revolution by presenting the lives of the people who lived in it. The Walking Dead holds the same message. You can tell a story about the zombie apocalypse by showing us the people who would live through it. Their ideologies compete. They get into arguments. They fall in love. We see the contours of the world through the relationships that form or get shattered. But there are no stakes to The Walking Dead. You can make a character who is as brutal a parody of whatever ideology you want. You can have them die an ugly death or survive against all odds to suit your narrative needs. Black Friday presents itself as half thriller and half educational tool. Tense pursuits by secret police and action events where you pull glass from the wounds of political leaders are met with long sections of careful environment study where the player unlocks story components. Those components, found in a separate menu, contain information about the real-life counterparts of torturer characters, the official books of the Iranian communists, speeches by Ayatollah Khomeini that paint him as duplicitous, and a number of other contextualizing pieces of information. 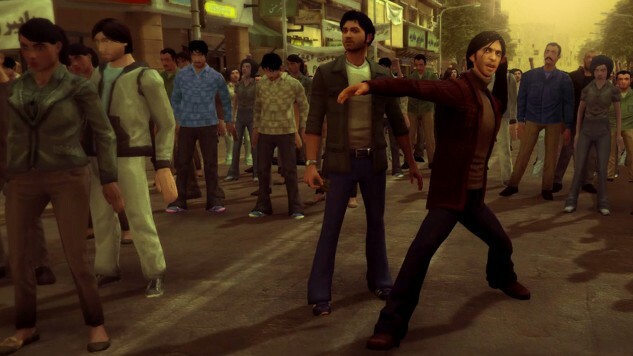 Your character, Reza, also takes photographs at a number of important events in the early Revolution, and the game shows you the real-world analogue of your character’s photos with snippets of information about them. There’s all of these real-life political moments. Iranian civilian protesters died (shot in slow-mo no less) as I hit buttons on my keyboard to dodge gunfire. The political choices that I made in-game to advocate for peaceful protest while refusing to disavow my brother who worked for the secret police didn’t seem to matter much in that moment. When players lambaste new releases for not respecting player choice, I’m often critical of how that rhetoric is deployed. But after Reza’s best friend bled out on the street, I was able to leave a small bit of Rumi’s poetry on his chest. I was able to do that because I picked up a wallet earlier in the game during a short adventure game segment. The scene faded out, and I was boggled. This is a game that purports to give you many different positions in relationship to the Iranian Revolution, but ultimately the choice I was given at the end was what kind of item I wanted to leave on the corpse of my compatriot. The Telltale method of branching story leading inevitably to singular story points might be better left to the transmedia fiction that studio excels at. The form might not be right for the Iranian Revolution. III. There’s a moment in 1979 Revolution: Black Friday where a leader is stabbed in a scuffle on-stage. Your character, Reza, has a photograph that could reveal who did it. All of the candidates are in the same theater, and you walk around and talk to each of them to figure out who wants your photographs the most. That person will want to see if they have been caught by the camera’s eye. The communists are represented here. The clergy are around. The Mujahedin are there as well. You speak to each of these groups, and they present their worldview to you. Some of them are aggressive toward you. Some are neutral. Some are positive. It’s impossible to know if the anger or politeness Reza experiences is coming from a place of politics, such as when the communists accuse him of being a spy, or from a place of sheer personal like or dislike. Reza’s existence as a character whose family supports the Shah, and whose brother is in the secret police, creates many complications so that you cannot drill these characters down to their ideologies. There’s all kinds of personality in the way. 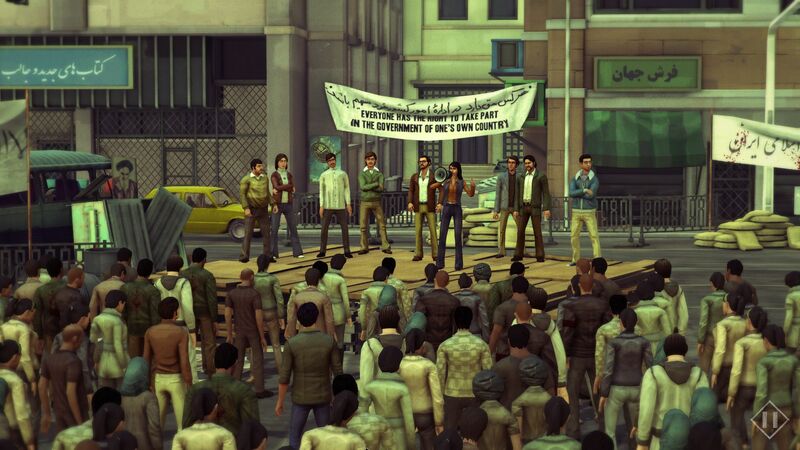 In this way, 1979 Revolution succeeds in representing politics itself where SimCity or Call of Duty fail. This game shows the true machinery at the heart of all processes. We are unable to point to a book and say “here is where their beliefs come from,” and there is no algorithm that determines whether the communists are going to hate you for your beliefs or your clothes. Each of the party groups merely exist and it is your job to realize that the politics do not begin and end at personal stories or abstracted figures. Instead, it is in the relationship between the party and the individual, especially the individual who is excluded from it. One might ask why all of these groups are housed under one roof for such an easy comparison and detective-like plot device. A character named Bibi brings them all together. She is an iron-willed coalitionist who has wrangled all of these figures together, and when you have “discovered” who the stabbing culprit is, you can report on him to her. The figure you choose is shown in a photograph later. He was clearly buried for a while. This, too, is a moment of showing how the party works. Requiring no proof, you can simply choose a character at random. Or you can choose the communist who hated your clothes. This is the party at work. IV. Over and over again, this game asserts that making art is the ultimate political act. “My pictures don’t have an agenda!” Reza tells his friend before taking dozens of politically-charged photos of civilians protesting, writing messages of revolt, and being beaten in the streets. A photograph represents things. An excellent photograph captures a set of relations, and those are the kinds of pictures that Reza is constantly reaching for in Black Friday. He wants to show the Iranian struggle in all of its different positions. This, too, is what Black Friday is doing. However, the Telltale-style form of game cannot perform the same work as a photograph—it cannot report a relationship. By its very structure, it cannot swerve too far from the path of the character-centered story that forces us to witness story arcs. We don’t have access to the fits and starts of revolution, and the game itself realizes that in the end.